The final letter for this series, 'Z' is here!! As I was scrambling to figure out what I should bake for the letter Z, my family insisted that I bake a savory bread again. I initially put down Zopf as the bread of my choice but figured out it was again a braided bread and I didn't want to repeat the pattern. Then I was pulled towards a Zebra bread, but it used a black color and I was not comfortable using artificial colors and didn't have the time to experiment with homemade natural black color. That was when I landed in Gayathri's space and found this Z'aatar bread intriguing. I kneaded the dough and ran (drove) to the store to get the Z'aatar spice mix. After looking for it in 3 stores, I finally realized that I would have to look in middle eastern specialty stores and went a further few miles to my favorite middle eastern store, got the spice, and finished baking the bread! So a frantic finale for the interesting month we have had at home !! I shall post a recap of the whole month in a day or two for future reference and breathe easy until the next mega marathon. We shall get back to the relaxed posting of 6-12 posts a month until then. Oh I shall surely miss the activity in my mornings trying to post, checking my fellow marathoner's posts and checking to see if my next day's post is ready. Thanks to Srivalli and my fellow marathoners for making this marathon an exciting one! In a bowl of warm milk, add sugar and yeast. Set aside for the yeast to froth up. In a stand mixer bowl, add the flours, salt and butter. Rub the butter into the flours. Pour in the yeast solution and knead to a soft and pliable dough. Place the dough in a well oiled bowl, cover and set aside in a warm place to double. [I left it for 2 hours]. Punch the dough and knead on a floured surface for a minute or two. Roll the dough into a thin rectangle about 10 X 7 (approximately). Apply butter generously. Sprinkle Z'aatar spice mix generously all over the flattened dough. Divide the rectangle into small squares of about 2.5 inches. Fold each small square like a triangle and fold the triangle into a smaller triangle and arrange in a greased 8 inch pan. [Refer picture]. After the bigger circle is filled up, arrange in the center in another circle. Cover for about 10-15 minutes while the oven is preheated to 350 °F. After the oven is preheated, brush the bread with milk and sprinkle sesame seeds and red pepper flakes as needed. Bake for about 30 minutes or until the bread is golden brown. After about 10 minutes, invert it onto a wire rack and set it right side up. Pull apart the bread and enjoy!! For the penultimate day of this series, I hurriedly baked this colorful bread. This bread is from Korea and probably is meat based. I have followed this recipe almost as is from Varada's space. She has used colored peppers and onions and made a delightful bread. The day I baked this bread, I was in a hurry to take the pictures before the sun light disappears and made a blunder of slicing it while it was still hot. So the bread turned out a little soggy. But it tasted awesome when toasted the next day. In a stand mixer bowl, add the flours, gluten, salt and butter. Rub the butter into the flours. Place the dough in a well oiled bowl, cover and set aside in a warm place to double. Place the sliced vegetables in a colander and sprinkle salt. Let them sweat a little bit. Pat dry the vegetables and mix in crumbled mozzarella cheese. After the dough has doubled, transfer onto a clean and floured work surface. Roll into a thick rectangle. Place the filling in the center and fold in the sides and seal the edges. Transfer the loaf onto a greased loaf pan, cover and set aside for 30 minutes. Sprinkle the remaining filling on the top of the bread. Preheat the oven to 375 °F. Bake the bread for 45 minutes. Switch off the oven. Leave the bread in the oven for another 10 minutes. Remove and let it cool for a few minutes. Invert onto the cooling rack, slice upon cooling. Makes a 9 inch loaf. In Bulgaria, this bread is among many other food items on the dinner table at gatherings during the Christmas season. The traditional dinner table is decorated with a centerpiece bread with any of the numerous designs. I picked mine to be sunflower shaped bread. A coin is hidden in the bread and the person who gets the coin is deemed lucky. There are a lot of European cultures where the hidden coin tradition is followed. For Day 24 of this Mega Marathon, it is the letter X. Since X is a difficult letter to pick up recipes for, I used Xmas as a short form for Christmas and made a Christmas bread which can be a centerpiece for any festive occasion. In a bowl of warm water, add sugar and yeast, mix well and set aside for 10 minutes until it froths up. In a stand mixer bowl, add flour, salt, vegetable oil and honey. Whisk well and add in the yeast solution. Knead into a soft and pliable dough. In a well oiled bowl, place the dough, cover and set aside in a warm place for the dough to double. [about 90 minutes]. Punch the dough and knead for a minute or so on a well floured surface. Roll out the dough into a circle about 3/4 inch thick. Transfer the circle of dough onto a parchment lined baking tray. Mark a center point and make a 'plus shaped slit through the center to the outer edge leaving about an inch. Then make 2 more slits through the center to make 8 petals, so to say. [Refer the picture]. Pull the 8 petals backwards and make the edges pointed. Roll out a circle with the small portion set aside earlier. Fit the circle in the middle of the petals and stretch it with your fingers to make a perfect fit. It should resemble a sunflower (!). Cover with cling wrap and set aside for 30-45 minutes for a second rise. Prick the center with a fork to release any air bubble, sprinkle black poppy seeds or black sesame seeds or like me use kalonji (onion seeds). Bake in a preheated oven at 375 °F. Bake until the crust is golden brown. I had to bake for 32 minutes. Remove and slice when it is still warm. Apply butter and enjoy the bread! A turnover is a type of pastry in which a piece of dough is filled with either a sweet or savory stuffing, sealed and baked. I tend to associate pastry with a sweet filling. But I came to know that savory and meat based fillings are very popular in Ireland and many other countries as well. 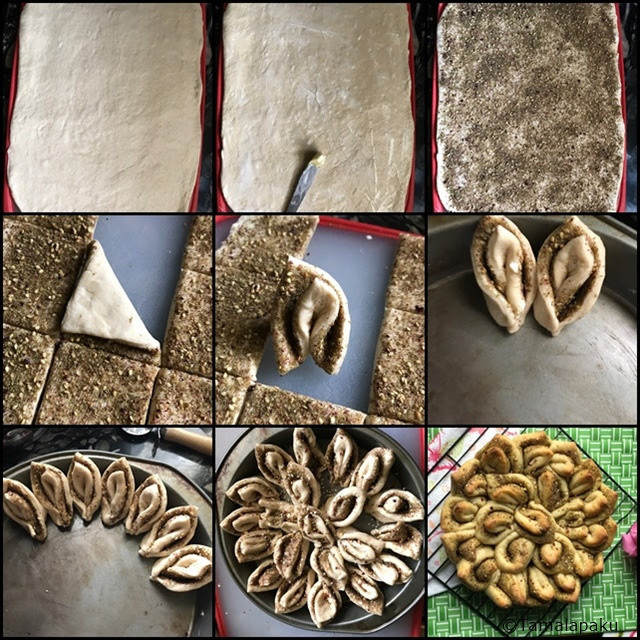 That is what I did, I filled it with an assortment of vegetables and crumbled paneer with the spices we favor and we have these vegetable turnovers. So when Kalyani casually mentioned that I could bake these turnovers with whole wheat, I realized that I had one in my drafts which will fit right in. I dug through my pictures folder and finally found the pictures. Fortunately I have a habit of drafting the post (with just the ingredients and procedure on the same day I cook/bake) and so I was saved a lot of work for the letter W.
I used the regular flour used to make chapatis and the dough didn't rise as much. I later learnt that adding vital wheat gluten makes a lot of difference. In a bowl of warm water, add sugar and yeast. Mix well and set aside in a warm place for the yeast to get activated. In a stand mixer bowl, add flours, salt and ajwain as needed. Rub in the butter so that the flour resembles bread crumbs. Whisk and add the yeast solution and knead for about 10 minutes until the dough is soft and elastic. Cover and set aside the dough for an hour or so for it to double. In a heated pan, add oil and saute onion and garlic for about 2 minutes. Add in the carrots, corn and peas. Cook for a minute or two until the veggies are just about cooked. Add in the gently mashed sweet potato and crumbled paneer. Mix in the green chili+cilantro paste and sprinkle salt as needed. Crush the roasted peanuts and add it to the mixture. Remove from heat and set aside. After the dough has doubled, deflate the dough, and divide into 12-14 portions. Flatten each portion into a rectangle or any shape of your preference. Arrange the filling in the middle of the rectangle(or any shape), seal the edges (I used the tines of the fork) and set aside on a parchment lined baking tray. Preheat the oven to 375 °F. Bake them for about 20-25 minutes or until they are brown all over. Remove from the oven and allow them to cool slightly. Enjoy with a sauce of your preference. These slightly sweet yeast rolls are blessed on Holy Saturday in the traditional Easter basket and are served up on Easter morning. I am sorry that the name is a mouth full but you will be glad to eat them. Velikonocni means Easter and Kruhki means small breads. It is surprising to note that these Easter rolls are traditionally egg free as well. They were a delightful addition to a potluck party. So V for Velikonocni Kruhki from Slovenia. In a bowl of warm milk add sugar and yeast and set aside for the yeast to get activated. In the stand mixer bowl, add the flour, salt, almond meal, powdered sugar, cardamom powder, butter, oil, lemon juice and zest. Whisk well. Slowly add the yeast milk mixture and gradually add the water used to soak the raisins. When the dough is more or less kneaded, add in the citrus peel, tutti fruti and drained raisins and knead until the dough is soft and pliable. Set aside the dough in an oiled bowl covered with cling wrap for about 2 hours or until the dough doubles. Roll each portion in the shape of a dinner roll. Arrange the rolls on a lined baking tray. Cover and set aside while the oven is preheated to 350 °F. Bake in the center rack for about 35 minutes or until the rols turn golden brown. Remove and allow them to cool. Serve with butter or jam. We enjoyed them just as they were, just mildly sweet with a hint of citrus and raisins/tutti fruti in every bite. Bliss!! This bread is also called Tashkent Non which is sold in the streets of Tashkent. This bread is traditionally made in a clay oven called Tandoor and tastes best when eaten hot out of the oven slathered with butter. In my recent disaster with my camera SD card, I was able to recover a few pictures of this bread and so I am so relieved. U for Uzbek Bread from Tashkent, Uzbekistan. In a bowl of warm water, add sugar and yeast and set aside. After the yeast froths up, add wheat flour and mix well. Set aside for about 15 minutes. In a stand mixer bowl add bread flour, salt and oil, whisk and then knead to a soft and pliable dough adding the yeast mixture. Place the dough in an oiled bowl, cover and set aside for the dough to double (about 2 hours). Deflate the dough and divide into 6 equal portions. Roll each portion of the dough into 1/2 inch discs. Just before baking, press one of the rolling pin into the center of the dough and then pierce the center with a fork in a 2 inch round pattern. Then brush the top of the bread with either milk, and sprinkle with sesame seeds. Bake for about 15-18 minutes until the top is evenly brown. Remove and brush with butter and serve them warm. We have entered the last week of this Mega Marathon and today we post the recipe for the letter 'T'. T for Tijgerbrood. The Tiger Bread is also known as the Dutch Crunch or Dutch Crust. It has been popular in the streets of Holland/Netherlands since the early 1970s. The mottled look of the bread makes it popular with the kids and adults alike. As I have mentioned in my previous post, I have lost quite a few pictures as the SD card of my camera got corrupted. I had another bread (Tsoureki, a Greek Pumpkin Sweet Bread) all ready and drafted when I realized that I had lost the pictures of this bread. I was so disappointed as this bread was loved by all at home. In fact my family insisted that I re-bake the Greek bread, but I couldn't lay my hands on the pumpkin and so decided to go with another bread. I am glad that this bread came out just as well and my little one was excited to see the tiger/giraffe pattern on the rolls. For the Tiger Paste - I felt this quantity of paste is way too much. So scale it down to 1/4th of the quantities mentioned below. In a bowl of warm water (1 cup), add sugar and yeast. Set aside for 10 minutes for it to froth up. In a bowl of warm water, add sugar, salt and yeast. Set aside for a few minutes. Add in the rice flour and sesame oil. make a paste and set aside for 15 minutes. Make equal portions of the dough and roll into smooth dinner rolls. Apply a thick coating of the tiger paste on each of the dinner rolls and arrange them 2 inches apart on a lined baking tray. Set aside for a second rise for about 15-20 minutes. Bake in the middle rack in a preheated oven at 350 °F for about 30-32 minutes or until the tops get a golden brown hue. Remove from the oven and let them cool on the wire rack. Wiki says "Semolina is the coarse purified wheat middlings of durum wheat mainly used in making pasta and couscous." 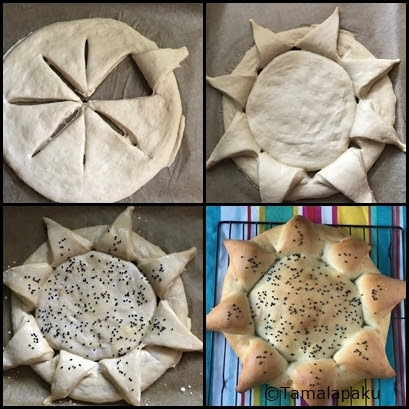 It is widely used in Indian cooking and so this bread was a delight to bake with an ingredient very close to my heart. When my brain gave up on me and no yeast breads would pop out, Kalyani came to my rescue and she suggested that I look into this bread as this bread never fails. And just as Kalyani assured me, this bread rose beautifully and I probably should have used a smaller loaf pan to get the 'crowning' effect. But the texture and bite were perfect. As I am composing this post, I am extremely disappointed that I lost loads of pictures from my SD card. But the silver lining is that I could recover a couple of pictures of this Semolina Bread. In a bowl add 1 1/2 cups of warm water, sugar and yeast. Mix well and set aside in a warm place for the yeast to get activated. In a stand mixer bowl, add the fine semolina, salt, olive oil and mix well. Add in the yeast solution and let the mixer knead for about 10-12 minutes until a soft and elastic dough is formed. Oil the bowl and set aside in a warm place for the dough to get doubled (about 2 hours). After the dough has doubled, deflate and roll into a loaf shape and place it in a 8 1/2 X 4 1/2 loaf pan, cling wrap loosely and place it in a warm place. After the dough has risen to the top of the loaf pan or just over the top, preheat the oven to 375 °F. Place the loaf pan in the middle rack and bake for about 35-40 minutes until the top is evenly brown and the sides are pulled to the center. Remove from the oven and let it sit in the loaf pan for about 5-10 minutes. Run a knife around the edges and invert over a cooling wire rack. Slice after the loaf is no longer warm. We enjoyed the slices toasted, as grilled sandwiches and as chili cheese toast.